Cobblers boss Keith Curle lamented a disastrous 10-minute first-half spell that cost his side dear during Tuesday’s 3-1 defeat at Newport County. Town were not at their best 28 minutes into the contest at Rodney Parade but looked well in the game when Andy Williams cancelled out Josh Sheehan fifth-minute opener. 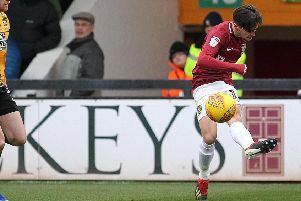 But Jamille Matt and then Padraig Ammond scored within four minutes of each other later in the half, both the result of poor defending, and that proved too much for the Cobblers to come back from. “There was a 10 minute spell in the first-half,” admitted Curle, who oversaw just his second league defeat since taking charge. “We got back to 1-1 but they then had that spell when they scored the second and third goal. “That’s the disappointment. In the second-half, on the balance of play, we probably had the best two chances. “Andy Williams gets a shot off if he sorts his feet out, (Daniel) Powelly would have scored with more pace on the ball and then Hakeem (Odoffin) had a free header just outside the six-yard box. The reappearance of Town’s defensive issues will send shivers down the spines of supporters having now conceded 10 in their last four games, but Curle played down any concern. He added: “Now’s not the time to be ultra critical of the players. It’s a very emotive game. “I’ve got emotions, and with the experience I’ve got I’m able to keep them in check.